RICO SORDA: ADVOCATE PHILIP SINEL - LETTER TO THE JERSEY EVENING POST. "The Chief Minister and Minister for Home Affairs have emerged from this saga with no disciplinary case, no Chief Officer, a pending report from a QC likely to be critical of the Island’s Government, and a bill for over a million pounds. They are not well placed to criticise the actions of others" Deputy Bob Hill............................................. Trevor Pitmans Blog.......................................BALDTRUTH"
ADVOCATE PHILIP SINEL - LETTER TO THE JERSEY EVENING POST. This is the letter Advocate Philip Sinel sent to the JEP. They asked him to cut it down to 450 words before they would consider it for publication. He was not prepared to "water it down" so it is left to Bloggers to publish un-redacted and not watered down. Advocate Sinel raises some very interesting questions where the JEP should look to be getting the answers to them and not asking him to water them down. He wrote this letter after hearing/reading the final submissions to the Care Inquiry from the States of Jersey Police, the Law Officers Department and the Chief Minister's Department. The SOJP, and more so, the Law Officers Department, took the opportunity to attack whistle blowers and those who investigated child abuse in Jersey. Advocate Sinel's letter was written BEFORE the LOD/SOJP/CMD wrote ANOTHER final submission repeating all the same attacks on those who stood up for the victims and survivors of child abuse. Why is the mainstream media so reluctant to report on the vast amount of juvenile remains discovered at Haut de la Garenne? Why aren't they asking the same questions as Advocate Sinel rather than asking him to water down his questions and observations? Recent newspaper coverage in relation to the work of the Independent Care Inquiry shows clearly that nothing positive will change in Jersey without external intervention. Indeed that coverage should give the average citizen cause for real concern in relation to the attitude of the Law Officer’s Department and the Police going forward. Before dealing with those topics the first article concerned a not unsurprising complaint by the Inquiry to the effect that they were being undermined by the Data Protection Commissioner, who, notwithstanding, the longevity of the Inquiry had waited until it was over before putting forward complaints on behalf of “anonymous complainants”. The Data Protection Commissioner is, in an ideal world, there to protect the rights of individuals. Is that what is being done here or is the Data Protection Commissioner lending herself to the whiles of the oligarchy? I then read that the Inquiry is being criticised for failing to call Stuart Syvret. Does anyone actually think that we, as an Island, believe for one moment that forcing former Senator Syvret to give evidence would have been in some way beneficial to the States of Jersey Police of the Law Officer’s Department? Would he have painted them in a better light than they will come out or otherwise? Additionally we are told that the Police regret appointing Lenny Harper. This as part of a submission made by a representative of the Law Officer’s Department to the Inquiry. The first point that occurred to me when I read that was who are these people who regret the appointment Mr Harper? We have almost no high ranking Police officers left who worked with Mr Harper. It may not have escaped many Islanders notice that we have had a succession of high ranking Policeman who have been forced out of office or criticised for investigating the wrong crimes. Or telling it like it is. Your article continues to attribute the following comment to Advocate Jeremy Garrod on behalf of the Police. One assumes, of course, that he has met some Policemen or has he? The criticism was put as follows “Mr Harper had been ill advised to tell the media that the potential remains of a child had been found at Haut de la Garenne care home”. Following tests it was revealed that the fragments were not human remains. Whilst Mr Power was still our Chief Officer the forensic report for Haut de la Garenne was publically available. It has since been removed from the States of Jersey Police website, why? I do not know. Perhaps the Data Protection Commissioner could find out for all of us. “The following are the main items of interest to the investigation from these areas. Blood in bath. Cellar 1, 50 +Human teeth cellars 3 and 4, Human bone fragments cellars 3 and 4, Blood stained cloth cellar 3”. “A significant amount of human remains have been recovered that is suggestive of foul play in relation to the cause of death and guilty knowledge during deposition. I like others am afraid unable to square the contents of that report with the position publicly adopted by our new Police Force and by the Law Officer’s Department. A very good letter, I hope it is eventually published in full in the JEP. As regards the lime pits, my opinion is as follows. At some point in the last few decades, there was possibly an outbreak of BSE in the Jersey cow herd. Obviously, there would have been a massive cover up when this occurred. As was seen in the UK BSE outbreak in the 1990s, pictures of the burning bodies of dead cows are bad for business, bad for tourism, but most importantly, bad for reputation. Remember, in Jersey, reputation is everything. Even if means covering up child abuse, the murder of hospital patients, the illegal suspension of police chiefs, dead car passengers, missing teenagers, or BSE in cattle. Dig a hole, drop in a few carcasses, fill it with lime, pay off the vet, talk about it down the lodge, don't mention it to anyone else. Especially not the media, with their pesky cameras and their questions. It's only a field in a children's home in St Martin, nobody will ever think of excavating there, will they? Are readers not at all curious that one of the scions of the Jersey dairy industry has from the outset been dead set against the child abuse inquiry and the digging at Haute de la Garenne? Go figure. The evidence of juvenile remains unearthed at Haut de la Garenne referred to in Advocate Sinel's letter (and removed from the SOJP website) can be found HERE. I don't buy or read the JEP because of the very reason pointed out in this blog. It either buries (pun not intended) stories or waters them down. I remember it used to publish a thing called "the Saturday interview" or something similar, is that still being published? If it is they could do a Saturday interview with Advocate Sinel which would be a double page spread then there would be no need to shorten (water down) his letter. This information should be known to the wider Jersey public including the link left by voice for children above because after reading that people can be in no doubt that children were buried at Haute De La Garrenne. Emma Martins has attacked the Care enquiry trying to discredit it. She has attacked whistleblower Stuart Syvret and gathered 4 proxies to hold a secret court case so she could have his blog closed down. Will the JEP be asking exactly what is her agenda? If this excellent letter by Advocate Sinel had been accepted for publication by the JEP, even if had taken a whole page of space, it would have been worth it. Longer letters have been published before. Quite frankly the submissions by the LOD and the SoJP were a disgrace. Not so much pointing out facts, but nasty back-stabbing vitriol which was not becoming to either party. Whilst there is no doubt aat all now that children were abused in Jersey's 'care' system, they still feel the need to focus and damn the very two police officers who caused this to come out in the open. All other evidence seems to go by the board. As the first commentor says - go figure. 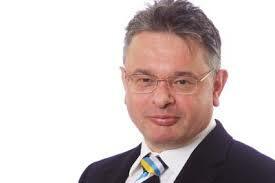 Mr Sinel asks why the report of childrens remains was taken off the Jersey police's website in his letter. Why doesn't the JEP ask the police that question? Re: my comment on July 2, 2016 at 2:14 AM, I should qualify it by saying that covering up an agricultural scandal is just one explanation for the lime pits. There are of course other far worse possible explanations. I find it hugely frustrating that the local media seems to have no interest in investigating the allegations that the holes were dug, then filled in the next day, then subsequent excavation found them to contain lime. At the very least it points to an agricultural cover up. If the pits were used for dead animals, why were such animals not disposed of in the usual way at the abattoir? One possibility is that too many questions would have been asked. Whatever the explanation, the complete lack of interest by the local media is baffling. Interview with Reform Jersey Chairman Deputy Sam Mezec after calling a meeting this Wednesday 6 July 7:30pm at St Helier Town Hall. AGAINST THE CUTS. I would like to beg Advocate Sinel to reconsider withdrawing his letter, and for him to resubmit a revision which focuses soley on the matter of human remains. The way I see it, so common is public acceptance of there having been no human remains discovered at HDLG, or just a "coconut" misidentified as human remains, that the issue of actual discovered remains NEEDS to be placed in the wider public domain. Surely this current opportunity is too important to be lost for the sake of a word count? Can you let us know if this letter makes it into the JEP? How can you rely on the jep to truly investigate and report on such matters, when it is possibly run by some politician's, (you don't believe me?) well how come on the day of the long awaited statement in the states by the health minister regarding the new hospital site, before he made one comment to the house that morning I had read the full outcome of his statement, the full storey with possible designs etc in the jep by 11am presumably the public knew before many states members, therefore it would be very interesting to know who told them what to print in advance. Rico is the letter in unredacted? I posted a copy of Advocate Sinel's letter unredacted in the comment section of an article on the JEP website. 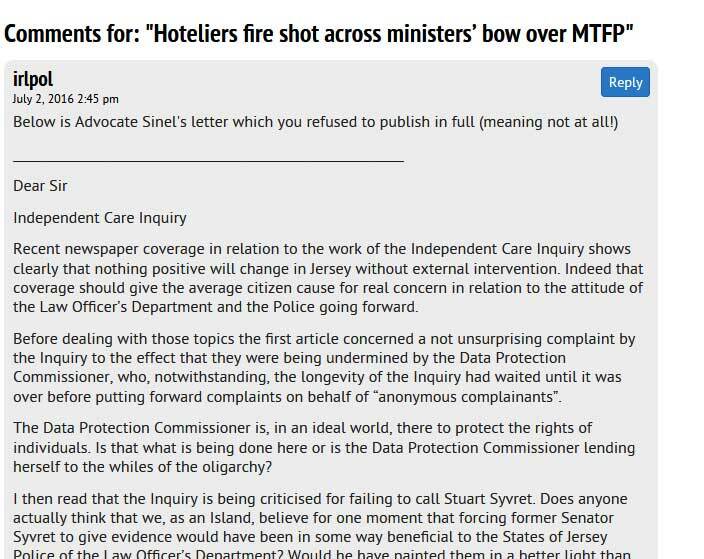 There was nowhere really appropriate to put it so I left it on the first article to accept comments on the day, which just happened to be about hoteliers giving out about the MTFP. It did get through, as you can see from the screenshot in the link below, but when I checked back today it was gone. I was just trying to make a point of some sort, not sure exactly what, and I now assume I am no longer a trusted commenter and will have any further comments moderated before/if they appear. Another great scoop Rico - Jersey hasn't got any decent journalists or a heritage media who will print the truth. This is why we need blogs like yours so please keep up the good work. It must be obvious to anyone with an ounce of intelligence that going to the UK media by the SoJ police force at the time brought to the surface the child abuse investigation so that it could not be ignored or trashed by interested parties as the law office with the help of the data lacky Emma Martin appear to be doing now. How far removed from reality is Jersey's Justice Department wanting to have a sneek look at the finished report so it could " legally " Mmmmmm challenge Francis Oldham and her panel into quiet submission before publication ? The finished report sadly even if it names names ( very unlikely ) or worse, attributes blame will just be shrugged off by those in charge. One wonders if the new PM of the UK is open to the reversing in of the Jersey enquiry evidence into the UK child abuse enquiry taking it out of the hands of a Government and Judiciary who hate critisism and as the latest damming of the hospital management shows have no apptitude or intention of meaningful change in Jersey's corridors of power. I have now reposted the letter under the Gorst Cuts piece online. It has appeared but no doubt will soon disappear like its predecessor. I preceded it with the text below. Below is the letter Advocate Sinel submitted to you and which you refused to publish in full. In asking for a redacted version of what is not an overlong letter you were effectively refusing publication. I have already submitted the text below in a comment on an article on the MTFP. Not, you might think an appropriate place, but then you seem to remove the opportunity to make comments on what you consider to be more sensitive subjects. An example would be the recent arrest of four child abuse predators. You have already removed my earlier comment and no doubt will remove this one also. It will make an interesting log for the day when the JEP is finally held to account for its complicity in these grave matter. Adrian Lynch North Coast SEARCH. Sure enough my posting of the letter in JEP comments has gone again. Have you, and your readers, VOTED? The candidates opening (and in one case closing) speeches from last night's St Clement Hustings and new poll can be viewed, and votes cast HERE. Adrian Lynch. Questions to Superintendent Stewart Gull. PART ONE. Why are you not talking about the population of Jersey (Channel Islands) having forced removal of copper-line telephone services, and mandatory replacement by 'more expensive' Fibre-Optic Technology. In other words, the population of the island of Jersey are being used (abused) to fund the installation of fibre-optic technology so that the finance industry can have this service at next to no cost to themselves. In an aggressive marketing campaign by Jersey Telecom - islanders are being told that they must have their copper lines removed (and being threatened by disconnection if they refuse to have fibre-optic technology installed), this of course is to provide a large customer base to financially support and subsidise a technology for the finance industry. Just another expensive burden forced upon the population of Jersey to yet again subsidise an industry which has captured its government and changed a democracy into a dictatorship. How many other islanders have had to face aggressive JT marketing calls and barrages of letters? However, the JCRA concluded that “no operator is dominant in the provision of wholesale off-island leased lines in Jersey” and there is no issue of capacity being constrained. If neither competition nor capacity is an issue, this suggests that the underlying structural position of the Island is inherently higher-cost and that the issue would need to be mitigated in other ways. In practice, this might require direct support to businesses dependent on high-volume connections in order to make their business model competitive on-island. Question: How does the States of Jersey fund fibre optic technology for the finance industry when there is no money in the pot? Answer: By making the entire population of Jersey become the customer base to pay for it!